There's nothing like a good smell in the kitchen. And when I'm not baking I want to make sure my kitchen smells good the same. 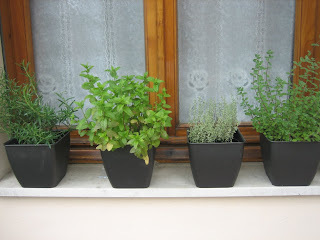 That's why I have this little herb “garden” or should I say “herb balcony”? Pots of rosemary, mint, thyme, marjoram, basil, and parsley (the last two are on the other side, but trust me they're there, just weren't presentable). The decision about yesterday’s dinner was kind of spontaneous. 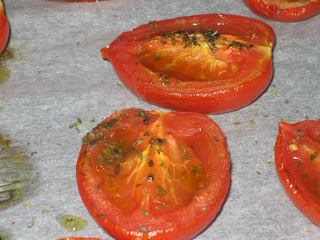 I saw a pack of very ripe San Marzano tomatoes lying around and I remembered I hadn’t made Slow roasted tomatoes in a very long time. They are very simple to make and you can do pretty much what you like with them. Eat them like salad, alone with bread or on bruschetta, season a pasta dish, they’ll keep well in the fridge and in the freezer (remember this in the summer when you get plenty of ripe tomatoes in your garden, store them in the freezer and you’ll get some sunny, summer flavor on cold winter days and evenings). 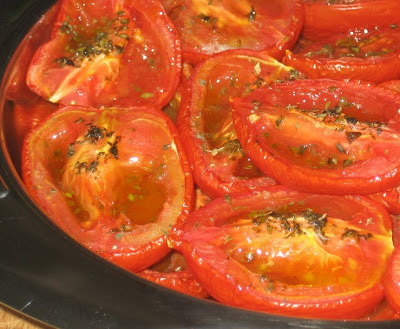 All you need for this recipe are tomatoes (Roma, San Marzano or any other type), fresh or dry herbs, and extra virgin olive oil. 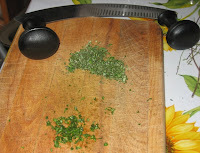 I just took a handful of fresh herbs and chopped them finely with mezzaluna. 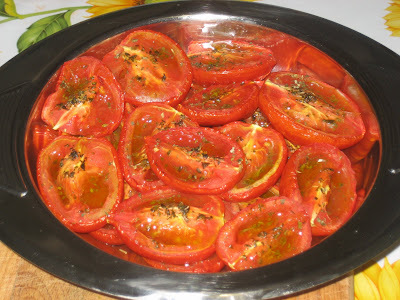 Cut tomatoes in two lengthwise, remove seeds with a finger, salt and sprinkle with your herbs. 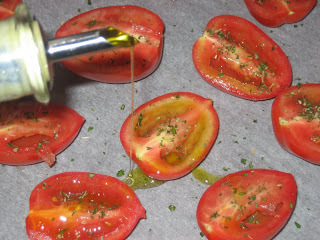 Drizzle with good olive oil and put in the oven. Normally, I’d roast them for three hours at 150 F (70°C), but I started preparing them late so I raised temperature to 220 F (100°C) and cooked them for 2 hours. Here they are, just out of the oven. Usually, when I plan dinner I start from the main dish and then decide what should go with it. This time, it was exactly the opposite. 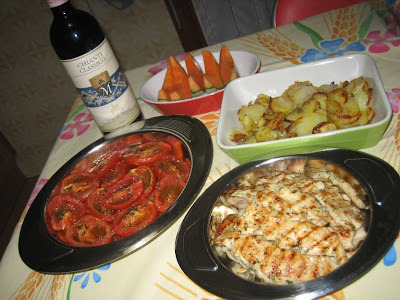 I grilled some chicken and turkey breasts and roasted some thinly sliced potatoes, to go with my roasted tomatoes. A glass of good red wine, and some fruit for dessert. 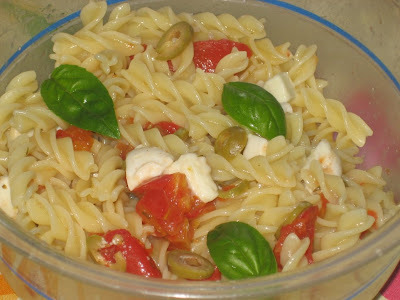 And today I made a pasta salad with chopped slow roasted tomatoes, thinly sliced green olives and fresh mozzarella. Odaberite sasvim zrele, mesnate rajčice. Prerežite ih napola po dužini, posolite i pospite svježim ili suhim aromatskim biljem (bosiljak, timijan, origano, list peršuna). Svaku polovicu pospite s malo maslinovog ulja. Pecite tri sata na 70°C ili 2 sata na 100-120°C. Poslužite kao salatu, prilog, dodatak tjestenini. Možete ih i zamrznuti. 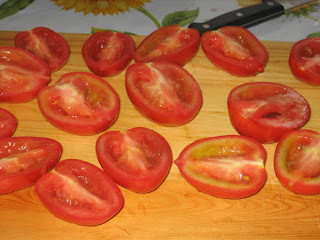 Lavate e asciugate i pomodori (San Marzano). Tagliateli a metà per senso di lunghezza. 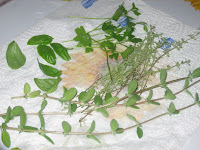 Salate e cospargete di olio extra vergine di oliva e un trito di erbe aromatiche (timo, origano, basilico, prezzemolo). Infornate per 3 ore a 70°C oppure 2 ore a 100-120°C. Servite come insalata, contorno, oppure aggiungete alla pasta. Si possono anche congelare. I love slow roasted tomatoes on pizza. Yours look fabulous too - love that you use fresh herbs. Quello assomiglia squisita!!! I love your Mezzaluna!!! That all looks so good!!! It's true, Cathy, they are great on pizza, and tonight I'm making some bruschette with them as well. 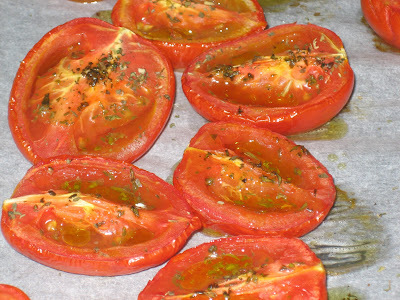 These slow roasted tomatoes sound delicious. I would love some bout now. So versatile, can use for many things. What a great idea! We have a few tomato plants this summer, so I'm sure I'll be using this idea. Thanks! Ruza i Goran * Hvala!!!! Did you know about... Zucchini? Sunday Muffins or Muffins Sunday?